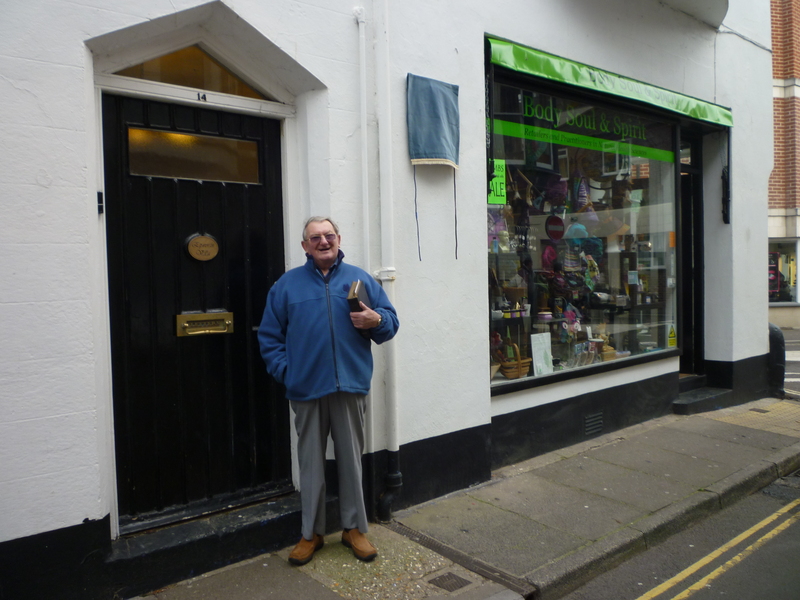 John Russell, Southampton District Archivist, outside Epworth Villa before the unveiling of the plaque that represents the culmination of his 15 months research, dealing with bureaucracy and fundraising. It all began at a meeting of our Southampton Methodist District ‘Synod’ on Saturday 12th May 2012 in Weymouth, when myself as District Archivist & Conservator, was approached by the Archivist of Weymouth Circuit, asking if I would be interested in knowing that an old Georgian residence in the town might possibly have a tenuous relationship with the early days of Methodism! This was because the owner who had recently purchased the property which was aptly named ‘Epworth Villa’ had received from her solicitor a bundle of ‘Deeds and Indentures’ all of which were written in the style of ‘Old English’ but which very clearly bore the name of John Wesley on several pages. I was given the address of the property and managed to find out the owners name and telephone number and so I rang her explaining who I was and asked if it would be convenient for me to pay her a visit in order to inspect the Deeds and the Indentures. Fortunately the owner readily agreed to my request and so I drove from my home to Weymouth and upon arrival found that she was very keen for me to carry out some research via all the paperwork that she had carefully laid out over her dining room table and must confess that I was then confronted by a batch of documents all written in a hand which I could not easily interpret but which very clearly referred to John Wesley so you can imagine my mounting excitement at this discovery of her home being closed connected with an early form of Methodism! Arrangements were made for me to have photographic copies of all the documents which were sent to me a few days later. My immediate act was to forward them to Dr John Vicars, an eminent Methodist historian, who happens to live not far away. I then trawled trough all eight volumes of John Wesley’s Journal in order to try and find an entry concerning his supposed visit to Weymouth but was frustrated by not finding the information I was seeking. However, Dr Vicars then contacted me saying that he also was unable to correctly decipher all the writing on the documents but did confirm that John Wesley’s name appeared on several of them. It then occurred to me that perhaps the name ‘Weymouth’ was a relatively modern one and so a phone call to my archivist friend at the Dorset Records Office was rewarded by being told that the town was formerly known as ‘Melcombe Regis’ in the days when His Majesty King George III often went there to bathe in the sea, so I went back to turn the pages of Wesley’s journals and on page 126 of Volume Six I came upon an entry which read as follows: 6th September 1776, I PREACHED AT THE NEW HOUSE IN MELCOMBE TO AS MANY AS IT WOULD WELL CONTAIN. Meanwhile all my enquiries were naturally taking some time and I was continuing to keep in close contact with the owner of ‘Epworth Villa’ and keeping her well informed of my progress slow as it was but by now we were both becoming quite excited in the knowledge that her home was definitely of Methodist historical value. But I still needed to have the deeds and indentures fully deciphered and it just so happened that I knew of a retired Methodist minister who also was chairman of the Dorset Family History Society, so I contacted him asking if he could possibly help and he suggested that the owner of ‘Epworth Villa’ get in touch with him so that arrangements could be made for her to pay him a visit with all the documents. This she did and being a very knowledgeable genealogist he soon was able to decipher them and had no hesitation confirming the visit of John Wesley to her home in 1776. Now things were beginning to warm up and also being a member myself of the Wesley Historical Society I contacted the Administrator, the Revd Donald Ryan, explaining what had been found out concerning an old Georgian house in Weymouth and how in 1776 it had received a visit by John Wesley. The Revd Ryan became very keen to know more and asked it he could see copies of the documents in question and these were sent to him. Being a Methodist heritage enthusiast I was also ensuring that Mrs Jo Hibbard, our national Methodist Heritage Officer at Methodist Church house in London, was being kept in formed about all aspects of my research and she was also sent copies of the relevant documents. 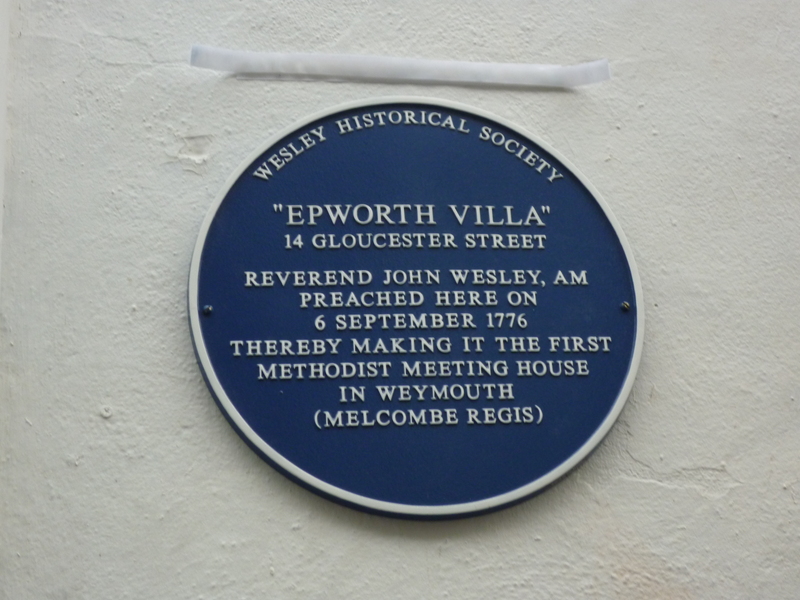 Then the thought struck me that the Weymouth Civic Society should be brought into the picture and asked if they would sanction the installation of a Wesley Commemorative Plaque on the frontage of ‘Epworth Villa’. Their spokesperson sent me a copy of their document entitled ‘Commemorative Plaques for Weymouth’ which gave details of plaques which have already been placed on various buildings in the town since 1994, with comprehensive instructions as to their size, colour, wording style, etc; and I was then told that because the property is Grade Two listed, the local council had also to be consulted for their views and to gain their consent for the plaque. All these procedures had to be gone through in order to achieve my objective and I was then confronted by reams of forms to be completed which then had to be put before a Council Committee which met periodically and I waited for many weeks for their reply only to be told that the person at the council who had been dealing with my request had since retired and that my application had inadvertently been mislaid, so would you believe that I had to start all over again! But then worse was to follow because a Weymouth Council refuse lorry somehow managed to reverse into the frontage of ‘Epworth Villa’ thereby causing untold damage to a Grade Two listed building! The owner then had to go through the slow process of getting the council to admit liability and for their insurers to inspect the damage and assess the cost of repairs. Eventually permission for the repair work to be carried out was given but this was no easy feat trying to find a reputable builder to repair and replace solid blocks of Portland stone but after several months it was achieved with a little help from the council. Finally in August a ‘Grant of Listed Building Consent’ was received and it was full steam ahead, but now I had to obtain quotes from various manufacturers of such plaques. Then after accepting a quote with what I thought was a reasonable amount I approached several organisations with a view to obtaining some help with funding and what I thought to be an easy task turned out to be anything but. Eventually I spoke to the chairman of my Methodist district and he kindly gave me permission to go cap in hand to our district treasurer, who agreed to pay seeing that it was an important district event. I order the plaque after consulting the Wesley Historical Society to discuss suitable wording for it then after it arrived safely at my home I began to send out invitations to its unveiling but not until a definite date had to be arranged with the Mayor of Weymouth whom I wanted to be present. 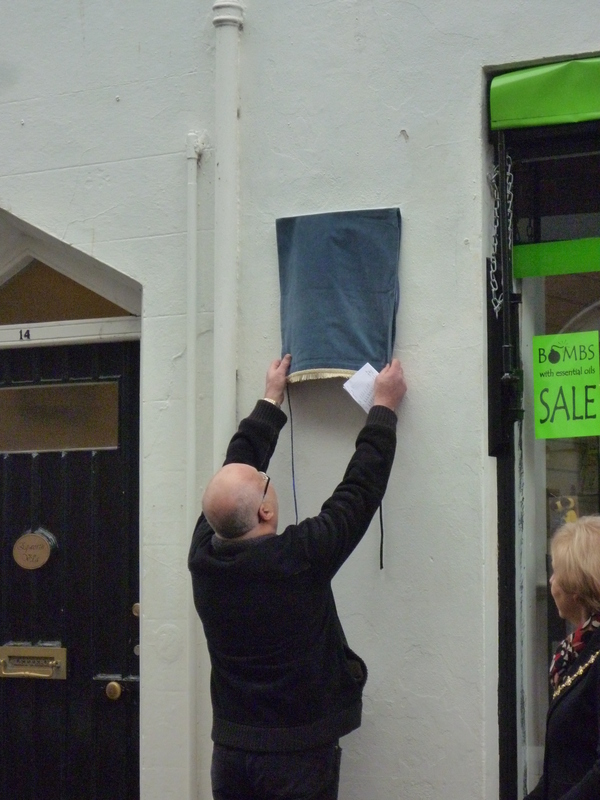 After several phone conversations with the Mayor’s PA and the completion of various forms, it was found that the Mayor would be delighted to attend the event and would be available for a short time on Monday 25th November. So numerous invitations were despatched and in good time and the response was heartening but unfortunately some were unable to attend due to other commitments. 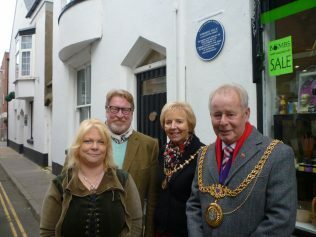 The plaque itself was duly unveiled at 12 noon on the said day in the presence of the Mayor and Mayoress of Weymouth. Also present was our national Methodist Heritage Officer, Mrs Jo Hibbard, from Methodist HQ in London. The whole event was given an enormous amount of publicity via the BBC website, TV South, local radio stations, local newspapers and magazines. The Dorset Echo newspaper went overboard by giving the event a full page article complete with a wonderful photograph.